When I was in kindergarten I discovered my first non-train, non-car, and non-construction vehicle based obsession in baby’s first geography lesson. There was a shape on the globe that seemed so much cooler than all the others. Part half-melted ice cream cone, part Octabrain side view. That was the place I wanted to know about and to go to one day. One day I did indeed go there, but the initial childish passion soon faded and I became like the rest…forgetful. Feel free to poll anybody you know in the humanities with a regional or even global focus. Ask them what regions they study. Odds are, if they aren’t indigenous culture anthropologists, that none of them focus on South America unless they happen to be from there. With less media-attention-grabbing gang wars than Central America and creeping towards almost a century without large scale conventional warfare, Post-Cold War South America seems a decidedly unsexy place to invest ones history or international relations major. I personally have never met anyone who specializes in either its past or contemporary political situation though I have met many people from the land mass itself. This is not me complaining about having no compadres with which to share my secret passion. My focus is on East and Central Asia as well as North America with secondary frequent guest stars Europe, East Africa, and the Middle East. Though its most probable I know more about South American history and politics than your average non-South American person, it is hardly my specialty. And while I have a particular fascination with Chilean history, food, and geography (I mean come on, both topographically and on the map it has the coolest country-shape of any of them) this has yet to extend to the rest of the nations there, in the present day anyway. But this is, I contend, a problem. Particularly for international relations. Why? Because not only is it criminally negligent to have one continent effectively written out of potential case studies, but also even more importantly because geopolitically speaking, it is an example of truly impressive kind of success. Of course there are other disputes which are not as famous. And of course these borders hardly drew themselves nicely. After independence the large realm liberated by Simon Bolivar split into many countries. A functionally speaking totally separate war of liberation was waged further south, and of course like all nations in the Americas the borders were drawn in the blood of the native people who lived there. Including by far the longest settler-native war in history, a back and forth struggle between Spanish Chile and then independent Chile (and sometimes Argentina) against the Mapuche people who were extremely effective at holding the government at bay for centuries. Then in the 19th Century the new states often struggled against each other to define their borders. The War of the Triple Alliance was a particularly devastating conflict when quite possibly the most incompetently over-ambitious state ruler in the history of the planet decided to play Napoleon against all of his neighbors at once to resolve a low level border dispute. It did not end well. Chile had much better luck taking on the combined forces of Peru and Bolivia in an utterly fascinating conflict if you are into ironclad warfare , though at the expense of losing extensive territorial claims in Patagonia to Argentina. When it comes to the War of the Pacific may I heavily recommend this book. But who didn’t have border problems in the 19th century? Settler societies were exploding everywhere. Europe’s ascendancy from second rate subcontinent to maritime hegemon was well confirmed. The world was changing faster than it had in a very long time. New resources were being mined and harvested on previously undreamed scales all while men with gurning smiles and bombastic mustaches nodded their approval in a manner which allowed their monocles to stay in place. And for now anyway, South America largely settled its border issues in that century, unlike basically every other populated continent ever. The most noticeable smear on the 20th Century was of course the Chaco War. A tragedy if you were there, and a tragicomedy if you were not due to the fact that Bolivia’s claims on Paraguay (which, spoiler alert, failed spectacularly), were based on a hypothesis that the disputed wasteland held a bounty of oil. This still has yet to be proven or exploited however, but even if that does pan out those soldiers and politicians of the nations who fought in the 1930s surely won’t see any of it. But compare even this nasty conflict with those of Europe, the Middle East, South Asia, and East Asia in the Twentieth Century. Less wealthy regions tend to be quite prone to state on state violence since World War II ended. One could counter with Central Asia as another example if one was willing to overlook it being (partly forcibly) incorporated into the USSR but its a bad case for that precise reason. The United States exerted dominance in South America of course, but indirectly and not unlike Britain had in the much more bloody 19th Century. To someone like me who is focused on geography as a primary mover rather than simple backdrop, many answers could be found in the layout of the countries. Most of them are in difficult mountainous or sparse terrain making many borders natural administrative divisions from Spanish rule or simply sensible. Frontiers are often sparsely settled minimizing land disputes. The big daddy, Brazil, has many of its landward borders in places barely, if at all, governed centrally. Taking another view, one could point that all of the countries save Brazil share the same language, and that the one outlier language is closely related. They also mostly had the same colonial power or similar powers. Economically speaking, these are very class stratified societies as well who might share common security interests in regime survival with each other which they would not want to test with the dangerous posturing of conventional armies. No matter what, South America is an interesting and incredibly stable place, something we are often told is only the state of being for affluent ones (funny that, historically speaking, Europe is probably the most warlike landmass on Earth on average but hey don’t tell that to any liberals, neo or otherwise). Many of its countries are getting more prosperous, and it certainly has many large insurgent movements, but its overall geopolitical stability puts any other continent save North America (obviously as one country for an entire continent and one continent without any countries in the cases of Australia and Antarctica are not in the running) to shame. Even Africa, whose often arbitrary colonial borders never seem to really move on the map, contains numerous proxies and factions which de facto control places all outside of official sanction. Why, outside of Latin America, is no one having these discussions? 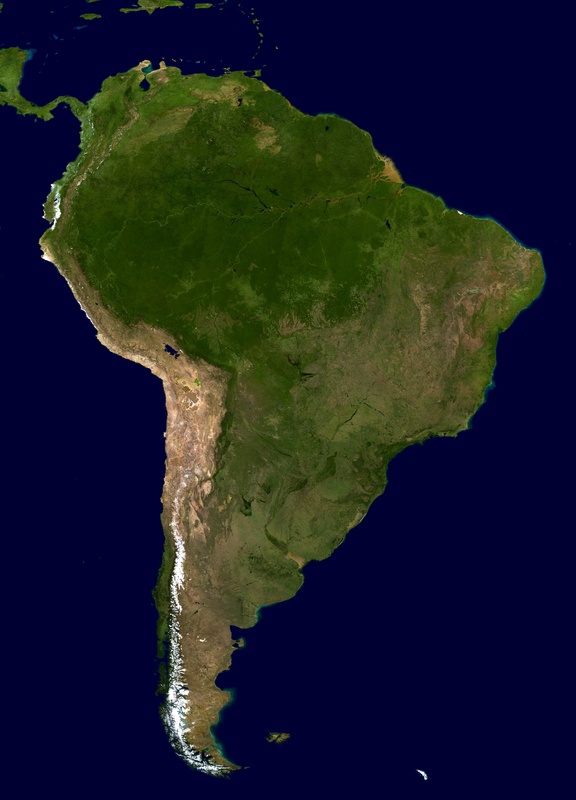 What if there is something to be learned from South America? I leave you with some native-inspired Columbian metal. And also fun facts about a strange canine from South America who eats fruit and has urine which smells like cannabis. Naturally one of the coolest animals ever.